Peter Blynn’s travel schedule made it tough to find time for workouts and to eat right. Precision Nutrition Coaching gave him the tools to master these challenges — and left him 33 pounds leaner and $25,000 richer. Peter Blynn was an expert on getting into shape. 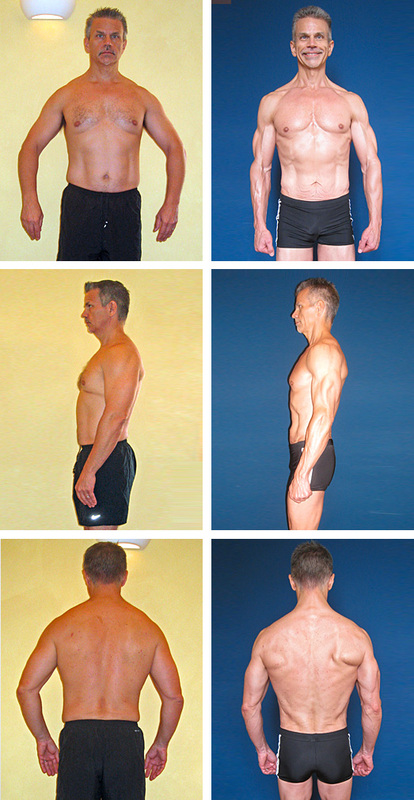 Over his lifetime, he must have started at least 25 different workout programs. Trouble was, he’d also stopped. So he fell into a kind of cycle. Fit and lean for a few months … less fit and fatter for a few more. A new program would grab his attention, and he’d try that one. Then life would get in the way, and he’d quit working out. “I did it so often it was almost a joke,” he says. Except, as he got older, the joke got a little less funny. Once upon a time, Peter could drop fat easily, and even gain muscle without extraordinary effort. But now, at 52, his old methods weren’t working. Now, it took him twice as long to get the same results — and with his busy schedule and family life, it was harder and harder to maintain improvements. Between family, travel, and being older, it was harder to get – and maintain – results. Who wouldn’t be challenged to stick to a workout schedule under those circumstances? Not only that, but like so many of us, when he’s stressed, Peter eats. And eats. In fact, at one point, he was gaining a kilo a month. He was living in Belgium — the land of frites with mayonnaise — and regularly making site visits to his client’s 25 offices in 22 countries. He was working late, staying at the office, ordering fast food for himself and his team — and gaining even faster. No wonder when he got serious about weight loss, he felt the need for a little support. In Precision Nutrition Coaching he got it. And now that he’s completed the program, this expert road warrior has a few tips to share with those who are just beginning their journey. As someone who works in the computer industry and who is involved in healthcare systems, Peter was comfortable with the Internet. And traveling as much as he does, he was drawn to the idea of online coaching. Peter, struggling with the challenges of travel, decides to invest in Precision Nutrition Coaching. Pick your route, and stick to it. Growing up in Pennsylvania, Peter had learned the importance of good nutrition from his mother, a home economics teacher. “The truth is, I probably knew ¾ of Precision Nutrition Coaching’s dietary recommendations before I started,” he says. And for months before he enrolled, he’d been trying to follow Precision Nutrition Coaching practices, like loading up on veggies, choosing lean protein, and limiting processed foods. Consistency means keeping yourself accountable. It also means persisting when the going gets tough. And for someone in Peter’s position, that was bound to happen. Resist your conditioning. Try something new and different. The fact is, even though his mom had taught him well, there were some lessons he needed to un-learn for the sake of his health. Now Peter recognizes it’s not so much that his mother was wrong. It’s just that the typical North American plate has changed a lot — for the worse — since that saying first came into use. Even in Europe, where portions are generally smaller and processed foods less common, people often eat more than their bodies need. In the end, he’s learned that he doesn’t have to ignore his mother completely. It’s still okay to clean his plate — providing he chooses a smaller one, and loads it with the right foods in the right proportions. When in Kiev, don’t do as the Kievans do. Travel can be exciting. Travel can be educational. Travel can be enriching. But let’s face it, travel can also be exhausting, especially when you’re doing it for work instead of for fun. Not only that, but it can seriously interfere with a person’s fitness goals. In some parts of the world, fat loss is not exactly part of the cultural program. Take Kiev. There, Peter reports, a favorite delicacy is lard. “Lard!” I can hear the amazement in his voice, even from a distance of 4,000 miles — or is that 6,400 kilometers? He’s referring to salo, cured fatback or pork belly, often eaten raw and sometimes, cooked with garlic and herbs. “They serve it to you as an appetizer, three or four different ways. Plain. Paprika. Smoked. Maybe some with skin. A whole plateful of the stuff.” It comes with the dark multi-grain bread of the region. And vodka. Not a glass of vodka, mind you. A bottle. “I tried it,” he says. “I ate a little.” He drank a bit of the vodka, too. When traveling, Peter sticks to healthy choices, and enjoys local delicacies, such as salo, in small portions. Pack heavy … and light. Most continental European hotel gyms do not, in Peter’s experience, resemble North American hotel gyms. “You’ll be okay in England. You can get lucky in Scandinavia and Benelux. But forget about Paris!” In fact, in some countries, the phrase “hotel gym” is a contradiction in terms. Hotels are about featherbeds, not about swinging kettlebells. While on the road, Peter prepares for the fact that hotel gyms may offer limited equipment. Be flexible if plans must change. Considering the extra barriers he was facing, Peter’s compliance with the workout schedule during Precision Nutrition Coaching was nothing short of remarkable. “I had to be flexible moving workouts between days of the week. Overall, I may have missed four workouts,” he says. Four workouts. Over an entire year. But here’s the kicker: Two of those workouts fell during the week before his final progress photos were due. The scene: Copenhagen, one of the healthiest cities in Europe, a place where 36% of all citizens commute to work by bicycle. His company had booked him into a boutique hotel near the World of Health IT Conference & Exhibition he was attending. Like many similar hotels, it did not have a real gym, he says. “Just several aerobic machines and a hi-definition television.” No problem, he figured. After all, there was a gym down the road that he’d used quite a few times in the past. In fact, at one point, when he’d been working in the city more regularly, he’d even been a member. But when he got to the gym’s reception area at 6:30 in the morning and asked if he could train there, the receptionist told him he was in arrears. Even though he’d officially withdrawn, they’d never cancelled his membership. Now the company wanted six months of back dues before they’d even let him in the door! One week until final photos were due. One last week to give the program everything he had. And now he couldn’t work out? “Psychologically, that was a bit of a disaster,” he says. Even worse, during the time he’d been away, this company had grown. They now owned half the gyms in Copenhagen! Another person might have given up. But not Peter. Instead, he shifted gears, jogged back to the hotel and did an aerobic workout. It’s that kind of focus and drive that made him a winner. Peter is modest about his achievements in the program. True, true, true, true, and true. But Peter faced challenges of his own that would have defeated many others. And in the process of overcoming them, he picked up tools to help him end the constant cycle of weight loss and weight gain that he’d been caught in for so long. Maintaining a stable weight is part of maintaining health. And since he’s become a father, health is more important to him than ever. Not only does he want to set a good example to his girls, but he also has to keep up with them! I ask him if there’s anything more he’d like to convey to potential clients. “You get what you pay for,” he says again. I know he means that this was a journey worth taking. Peter, keeping up with his daughters. Want to read more great stories like Peter’s? Then come meet a few other men, women, and couples who lost weight, started eating better, and took control of their health.